Convert your Videos and VHS tapes to DVD or digital files! PAL Converted to US Format (NTSC) - add $30.00 to cost of the transfer. All video transfers are transferred to DVD using only premium quality DVD's. All transfers come standard with a vinyl library case and cover printed with a title of your choice. Upgrade to a custom package that includes images from your DVD on the library case, a custom disc label and an opening title and graphics at the start of DVD for $20.00. Order extra copies of your video transfer to DVD for family and friends for $10.00 each. We transfer your videos to DVD using premium quality DVD’s. They are recorded in DVD-R format for maximum compatibility with DVD players. All transfers come standard with a vinyl library case and a cover printed with a title of your choice. You can customize your DVD case with images from the DVD or you can personalize the title with graphics. All straight DVD transfers (no editing) have a chapter at 5 minute intervals to allow you to rapidly search through the DVD. After converting your videotape, all original tapes are returned in their original condition. Tapes recorded in the LP speed (4 hrs.- VHS) on a VCR are usually slightly grainier than tapes recorded at SP speed (2 hrs.- VHS). They also sometimes have problems with tracking lines. All attempts to transfer VHS to DVD are made to minimize these lines. Tapes recorded in the EP or SLP speed (6 to 8 hrs.-VHS) on VCR have even more grain. On a VHS, Video 8 & miniDV conversion, we use only the highest quality machines to sharpen or upscale the picture. We can also convert your tapes into files such as AVI, MPEG-2, MPEG-4, WMV, FLV, Apple MAC Quicktime MOV & H.264. 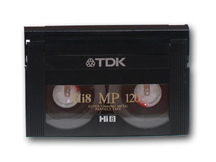 Foreign tapes recorded in PAL or SECAM can be transferred to the US format (NTSC). Tapes that are damaged or broken cost up to $25.00 for repair. Once we fix or repair a tape, we can put it onto a digital format. There is no charge if the tape cannot be repaired. Tapes that are crinkled in a spot can be seamlessly edited out. Tapes that have moderate heat damage can sometimes be repaired and then transferred. Tapes that have been damaged by extreme heat are usually beyond repair. A MiniDV is a digital tape, but can get twisted, scorched or broken.